Saving the Chicago Public Schools system has become a major flash point between Mayor Rahm Emanuel and Illinois Gov. Bruce Rauner. The two longtime friends are clashing over a proposal to inject $500 million into a school district that happens to be about that much short of breaking even this year. CPS CEO Forrest Claypool has warned of massive teacher layoffs unless the state acts. No solution seems to be in sight, so the war of words escalates. The mayor today accused Gov. Rauner of holding Chicago Public Schools “hostage” to his union-weakening, pro-business agenda. That’s because the governor, as he repeated Monday, says he would only support a plan to have the state alleviate $500 million in pension debt if Mayor Emanuel agrees to help convince lawmakers like House Speaker Michael Madigan to pass his turnaround agenda. Rauner followed that by saying he was "very disappointed" in the mayor and said help for CPS would not happen without the mayor fully on board. Tuesday, Emanuel pleaded to his longtime friend to bring the political games to an end. Senate President John Cullerton has agreed to the bailout plan. Speaker Madigan has said he supports some of the ideas behind it, but not the current bill that’s out there, signifying there is still some work to do on it, even though layoffs and a possible teacher strike loom. Also today the city’s Law Department is drawing heat over the revelation that a top city attorney purposely withheld evidence in a police shooting case. This is the case involving the shooting death of Darius Pinex in 2011. A federal judge determined that a top city official in the corporation counsel’s office purposely concealed evidence in this case. The attorney was fired. The mayor says today despite the wrongdoing, he is sticking by the head of the law department, Steve Patton. But an influential Chicago congressman, Danny Davis, says the Justice Department probe into the Chicago Police Department should now extend into the city’s Law Department. “I don’t think you can separate the two altogether. Because they are connected, I would think the Justice Department should take a look at how these things happened,” Davis said. Emanuel said he didn’t believe the Justice Department probe should extend into the law department. Davis and fellow Congressman Bobby Rush appeared with the mayor today to announce the expansion of a program that gives ex-offenders apprenticeships with the CTA. 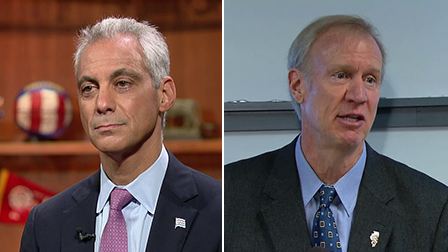 Rush and Davis offered their tepid support of Emanuel to solve the problems of the police department, despite his unpopularity in the African-American community. The governor unveils a plan he says will save taxpayers billions every year and has some strong words for Mayor Rahm Emanuel. Forrest Claypool is reiterating his call for funding equity from Springfield, saying that if CPS students make up 20 percent of Illinois public school students then the district should receive 20 percent of funding. Nov. 3: Illinois is in its fifth month without a state budget and Mayor Rahm Emanuel and Gov. Bruce Rauner have traded barbs over how to resolve the impasse that is sucking all of the oxygen up in Springfield.